About a week ago, I discovered an amazing artist who I had never heard of, despite the past few months of vigorous art blog and e-zine browsing. There was a segment in one of my favorite fantasy shows, The Secret Lives of The Super Rich, that covered the growing popularity of Art Basel among the art-loving 2 percent. The segment followed an older couple who, among a select group of other wealthy collectors, enjoyed a “first dibs” browse of the works on display. I found it quite funny that the narrator of the show mentioned that there seemed to be.. ” alot of really expensive stuff that shouldn’t be called art”. This couple, however, was looking for real art. Something new and exciting to add to their current multi-million dollar collection. From what I observed, they bought at least 5 different works of “art”. By the end of the spree(which lasted about an hour), the couple was reported to have spent around $300,000! One of the works that they purchased was a kind of second-chance offering for another painting that had already been sold. In fact, the curator literally pulled it from a nearby closet. 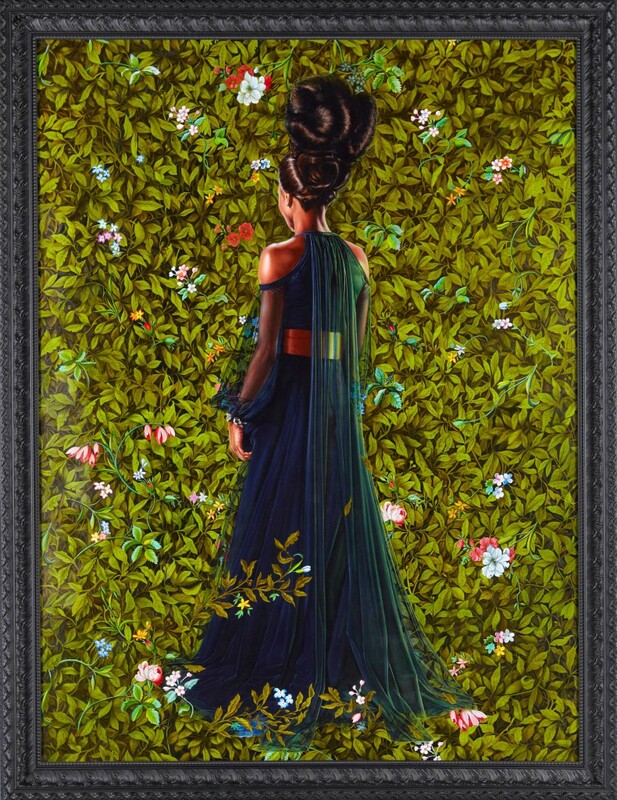 It was an original oil painting by renowned artist Kehinde Wiley. A beautiful 96″ x 72″ canvas from his An Economy of Grace series. Although both paintings were shown for only a few moments, I could tell that it had been painted by an artist of considerable talent. The buyers were familiar with the artist and did not blink at the $125,000 asking price! A few days after recording that episode, I went back to my DVR to review the segment again. I pressed replay several times so I could catch the name of the artist. After 5 or 6 replays, I kept hearing “Candy Wiley”. I knew that first name couldn’t be right, but I searched it in Google anyway. Maybe enough people had misheard the name as I did. Of course, Google made the connection(and the correction) and offered the artist’s name and website within the results. Wow! I must admit that I have not seen or heard of such a celebrated African-American painter since Jean-Michel Basquiat. I’m sure that statement has been made many times over during Mr. Wiley’s rise to prominence, despite that fact that their painting styles are completely different. I guess what surprised me the most about my discovery of Kehinde Wiley is that without having any prior knowledge of the artist, I developed an opinion – even a mental image of who I thought the artist might be. Based on a few glimpses of his work, I was thoroughly impressed. It was apparent that the subject in all of the paintings was a brown-skinned male or female – painted with the skill of a renaissance master. I am ashamed to admit that I did not expect the artist to be African-American. I questioned why a (white)artist would focus solely on black/brown subjects. I doubted, momentarily, that a black artist could be a modern master. I was pleasantly surprised(and humbled) to learn otherwise.